This site is for anyone who wants to find out about Germany, keep in touch with things German or perhaps come and live here. It contains my slightly unorthodox collection of German themes, not what you may be used to hearing about Germany. I add new subjects now and then and am always tinkering with the existing ones. 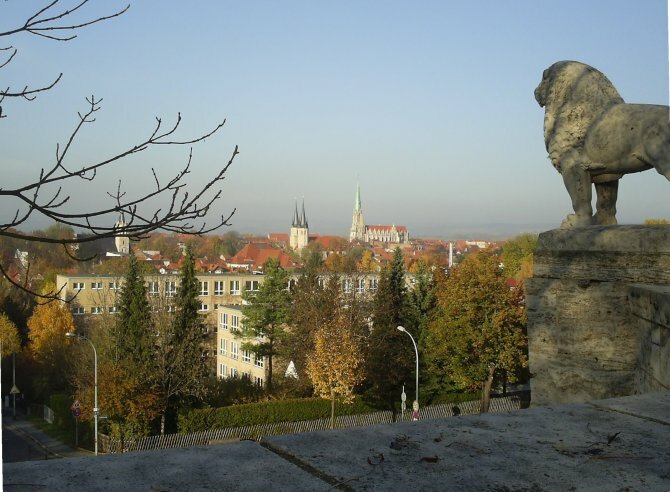 One theme dominates: the beautiful old city of Mühlhausen http://www.muehlhausen.de/ in Thüringen in what used to be the German Democratic Republic, and how I went about building a house there. For anyone interested in buying, building or restoring a new home, this is the place. Property prices are still incredibly low when compared with most of Western Europe, and the actual work involved costs less than a third of what it would cost in the United Kingdom. However, the German property market is beginning to attract large foreign investors and an upturn is very much on the way. Why do British pensioners never think of escaping to somewhere other than France or Spain? Or Gozo? It can't be because of language problems. How many of them speak another language really well anyway? There are people, presumably not pensioners, who buy up farms in Hungary or Romania. But why do so few think of East Germany as a viable place to retire to? Well, that's what I did in 2004 and I can highly recommend it. I haven't been lonely, helplessly confused or homesick for a moment. 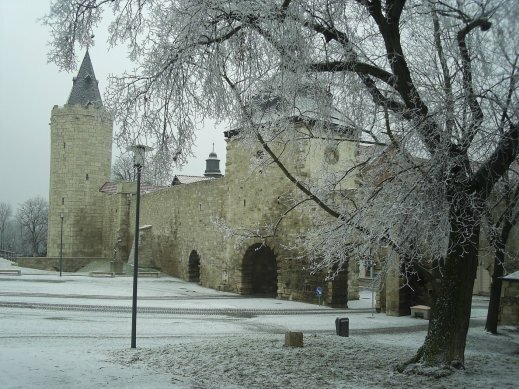 It was the beautiful mediaeval city of Mühlhausen http://www.muehlhausen.de/that fascinated me from my first brief visit here in 1994. True, I speak German since schooldays and one of my sons has also moved here, so that I'm not without company. But the main reason for coming here was the wish to buy a house, something I could never have afforded in Hampshire. House prices here are about a third of what they are in Britain, if you want to move straight into a ready-made home. I looked at several but finally decided to buy a dilapidated old building just within the old city walls and rebuild it. Your first reaction might be: quite mad! Or: house-building is tough enough in Britain! Don't know about that as it wasn't an option for me. I can only say that it has been the best thing I ever did so far. The house is proving wonderful to live in and I have got to know a lot of kind, helpful and genuinely friendly people. More about that in due course. First, a look at the City of Mühlhausen , so that you can see why I wanted to live here. 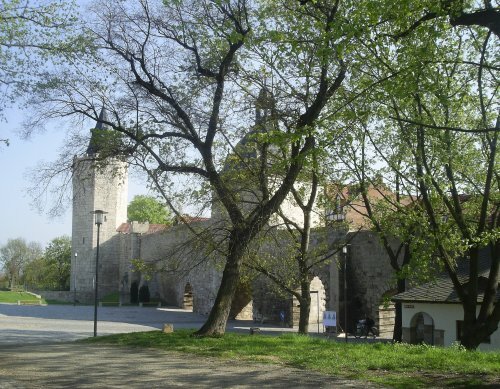 What you see is an architectural combination of mediaeval Gothic and 20th-century functional building. This tells you a lot about the city. It was, until a few years after Germany got re-united in 1990, a place full of different industries, and during the Middle Ages it belonged to the Hanseatic League, that powerful organisation of rich trading cities that stretched right across northern Europe. Disclaimer: I do not accept any responsibility for the information practices of a web site you are able to access through a link on my web site. The inclusion of a link to a third party web site contained on my web site does not mean that I endorse that third party web site. Bestgermany.com for general information about Germany including history, government, German business, German Tourist Organisation, international relationships, and more.